Miriam Johnson was born May 25, 1943, in Phoenix, Arizona, and raised in a strict Pentecostal home. Her mother was a Pentecostal preacher and her father was a race-car driver. At age 11, Colter became the pianist at her church. After graduating from Mesa High School in 1961, she began singing in local clubs in Phoenix. After marrying guitarist Duane Eddy in 1961, and still using her real name of Miriam Johnson, she issued two singles that were issued on the Jamie label. The first, "Lonesome Road", received scattered airplay in several US markets, though not enough to make any national charts. After a second single failed to even get regional airplay, Johnson did not record again for nearly a decade. She continued to tour with Eddy until divorcing in 1968. The following year, she met country artist Waylon Jennings who helped her secure a recording contract with RCA Victor. In 1975, Colter was signed with Capitol Records. On the label, she released her debut single, "I'm Not Lisa". The song was Colter's breakthrough single; it reached No. 1 on the Billboard Country Chart and peaked at No. 4 on the Billboard Pop Chart, becoming a crossover hit in 1975. 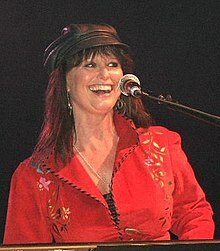 Her second album, titled I'm Jessi Colter was also released that year and reached No. 1 on the Cashbox Top Country Albums chart, No. 4 on the Billboard Country Albums Chart and No. 50 on the Billboard 200 Top 100 Pop Albums chart. The follow-up single from that same album "What's Happened to Blue Eyes" was also very successful, peaking at No. 5 on the Billboard Country Chart and No. 57 on the Pop Chart. The single's B-side, "You Ain't Never Been Loved (Like I'm Gonna Love You)," charted among the Top Pop 100 also in 1975. A survey of industry sources reveals that Capitol was releasing both “You Ain’t Never Been Loved” and “What’s Happened to Blue Eyes” as simultaneous singles for the Pop and Country markets. The confusion in marketing was made evident when programmers were uncertain of which single to play. Both sides of the same record scored on the Pop Top 100, but “What’s Happened to Blue Eyes” powered into the Country Top 5. Capitol clearly recognized that a miscalculation had occurred and subsequently purchased full-page industry ads saying, “We’ve FLIPPED. What’s Happened to Blue Eyes IS the single.” It was too little, too late. With two competing singles marketed to radio, Capitol's risky move made certain that Colter would not naturally follow-up the success of ‘I’m Not Lisa’ in the Pop Top 40. The second single was nevertheless a huge country/pop success and later that year, Colter launched a nationwide tour as part of Waylon Jennings's program at the Santa Monica Civic Center. In 1976 Colter released her second and third Capitol studio albums, Jessi and Diamond in the Rough. Both albums were as successful as Colter's 1975 album, both debuting at No. 4 on the Top Country Albums chart. The lead single from her Jessi album, "It's Morning (And I Still Love You)" was a Top 15 country hit in 1976on the country charts. Her second album that year, Diamond in the Rough produced only one charting single,"I Thought I Heard You Calling My Name". At this point, Colter had established herself as a big-selling “albums artist,” rather than a casual honky-tonk hitmaker, given that her talents were far more inclined to soul-rock than to mundane country music. For the remainder of the decade, Colter toured with her husband, Waylon Jennings, and released her studio album Mirriam in 1977. She then released her next album, That's the Way a Cowboy Rocks and Rolls the following year. Her success began to decline through the remainder of the decade, with her final two albums of the decade not producing any Top 40 country hits. In 1981, Colter and her husband returned to release a duet album entitled Leather and Lace. The album's first single, "Storms Never Last," was written by Colter, and the second single, "The Wild Side of Life"/"It Wasn't God Who Made Honky Tonk Angels," was also a major hit in 1981, peaking at No. 10 on the Billboard Country Chart. The album was certified Gold in sales by the RIAA that year, Colter's second RIAA-certified album to date. Stevie Nicks wrote the title track of the album; however, after receiving word that Colter and Jennings might divorce, Nicks released her own version of the song as a duet with Don Henley. It peaked at No. 6 on Pop chart, also in 1981. Also in 1981 Colter released her final studio album on Capitol records, Ridin' Shotgun, which also spawned Colter's last charting single on the country charts, "Holdin' On". The album was given many positive reviews, including Allmusic, which gave the album four out of five stars in 2006. Out of the Ashes was her first album since 1981 to chart on the Top Country Albums chart, peaking at No. 61. In 2007 Colter recorded a duet version of her 1975 hit "I'm Not Lisa" with Deana Carter on her 2007 album, The Chain. In 2017, Colter and Jan Howard provided guest vocals to a track appearing on Written In Song, an album by Jeannie Seely. The song, called "We're Still Hangin' In There Ain't We Jessi", references how Seely and Colter are seemingly two of the only women in country music who managed to have a successful marriage. Colter's first album in eleven years, The Psalms was released on March 24 via Legacy Recordings. The album consisted of Colter's favourite Book of Psalms passages put to music and was produced by Lenny Kaye, who recalled an evening when he, Colter, Jennings and Patti Smith were having dinner together in 1995 when Colter began to sing passages of the Bible. Kaye stated that he was "transfixed" and kept the evening in his mind until he convinced Colter to record those renditions in 2007, with the album being recorded over the course of two sessions, along with a further two in 2008. Of the album, Kaye stated that "we tried to choose songs that weren't about warring peoples but more about comfort and reconciliation". On April 11, 2017, Colter released a tell-all memoir titled "An Outlaw and a Lady: A Memoir of Music, Life with Waylon, and the Faith That Brought Me Home". Colter met guitarist Duane Eddy in Phoenix. He produced her first record, and she toured with him. They were married in 1961 in Las Vegas, settling in Los Angeles. She pursued a career as a songwriter under her married name, Mirriam Eddy. Her songs were recorded by Don Gibson, Nancy Sinatra, and Dottie West. Colter and Eddy have a daughter, Jennifer. In 1968, Eddy and Colter separated, divorcing later that year. Colter moved back to Arizona. In 1969 she met and married Waylon Jennings. At this time, Colter adopted her stage name, Jessi Colter, in honor of her great-grandfather, Jesse Colter. Colter then moved to Nashville, Tennessee, with Jennings. Colter and Jennings had one son, Waylon Albright "Shooter" Jennings (born May 19, 1979). In the early 1980s, Colter and Jennings nearly divorced due to his addiction to drugs and other forms of substance abuse. However, they remained together until Jennings's death in 2002. ^ Jessi Colter biography Allmusic. retrieved 8-8-08. ^ "The International Who's Who in Popular Music 2002". google.ca. ^ "Jessi Colter Biography". OLDIES.com. ^ a b c "Jessi Colter Bio - Jessi Colter Career". CMT Artists. ^ "Grammy Hall of Fame Honors Country Songs". CMT News.